Since my miscarriage in October, a darkness has taken up residency here. I had hoped that my most recent pregnancy would bring some light to my world (and to this blog) once again. 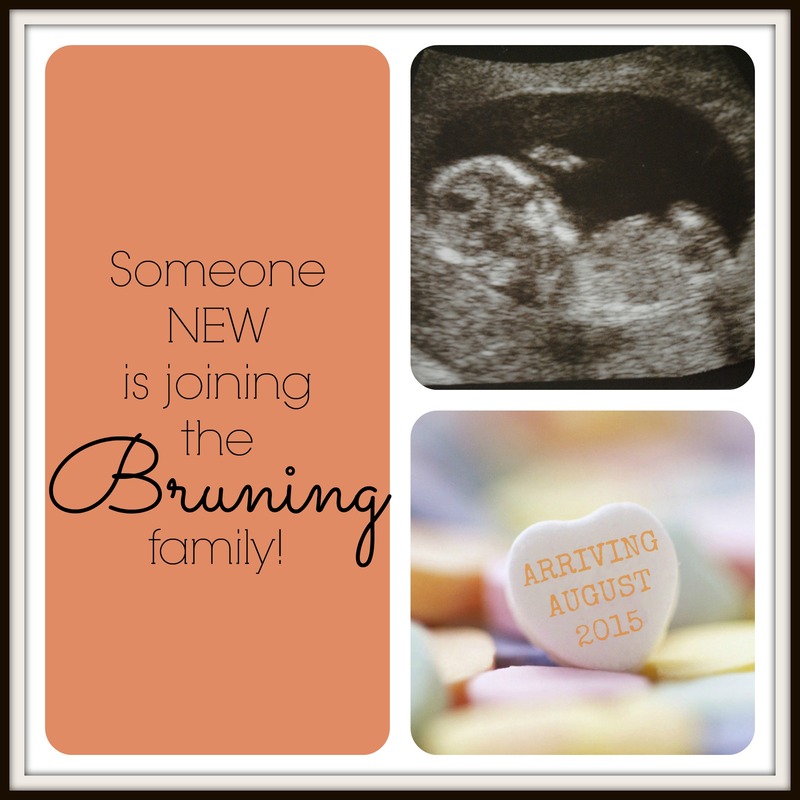 My second trimester started with an ultrasound around 13 weeks. Everything looked normal, although the baby wasn’t very active and the ultrasound technician wasn’t able to get the measurements he needed to complete the screening for chromosomal abnormalities. So instead, they offered me a blood test that would screen for the same issues and would give me the added bonus of knowing the baby’s gender well before my 20 week ultrasound. Once we had that ultrasound in hand and had heard the heartbeat once more, I felt comfortable sharing our good news with the world at large (aka, my facebook community). This was the week before Valentine’s Day. In the week to follow, I had my blood drawn for the test, and about 1 week later, I received a phone call from my OB’s office. 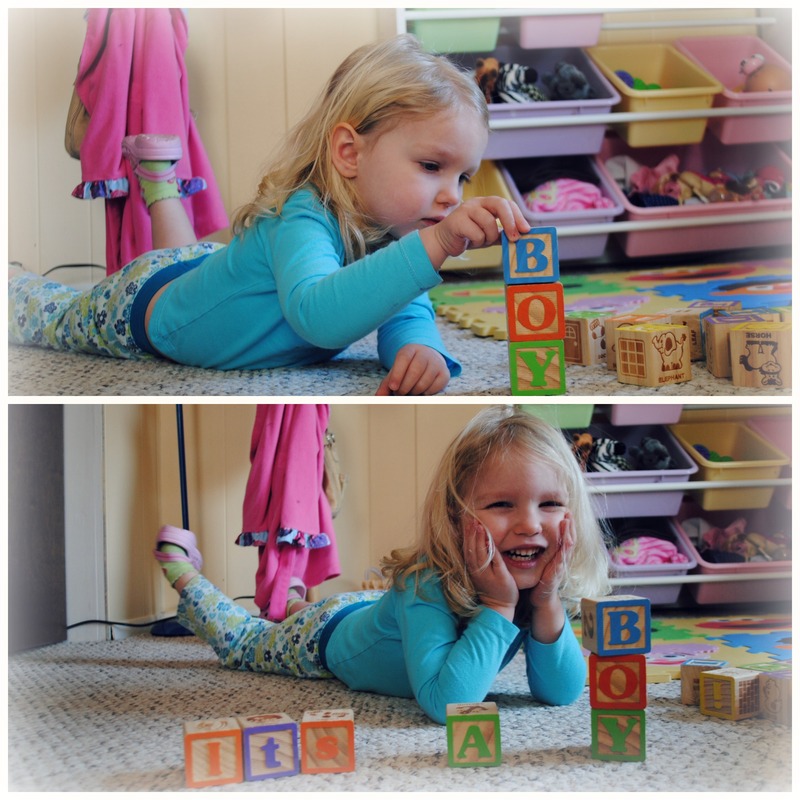 They called to share the good news that the baby was at low risk for chromosomal abnormalities and the surprising news that we were expecting a BOY! I was completely taken aback because I was pretty convinced that we were having another girl, but I was happy just the same and I knew that Michael would be elated. I ran out to the store that day to buy a cute little boy outfit and some bibs, wrapped them up, and gave them to him as a way of sharing the good news. We were so very excited and even though Evelyn was in denial for a few days (she was convinced that she wanted a sister), she came around to the idea that she would have a little brother. Michael had told me in our early days of dating that if he ever had a son, the baby would be named after his father and his oldest brother, who shared the same name and who had both passed on years before. So, we already knew what we would call him and Evelyn was excited to help us decide what his nickname would be. She started telling everyone about the baby in mom’s belly named Robbie. So, shortly thereafter, I shared the good news once again. By this time, I was about 15 weeks pregnant and was finally starting to feel better after months of being sick. But then I got sick once more with the 24 hour stomach bug. Finally, on a Thursday, I woke up in the wee hours of the morning, starting to feel better again. I put my hand to my belly and was overcome by the “feeling” of not being pregnant anymore. At the moment, I brushed it off as just a silly paranoid feeling, but now looking back, I believe that was the moment my baby boy’s heart stopped beating. I was exactly 16 weeks pregnant. I guess it was that moment in the middle of the night that prompted me to pull out the fetal heart monitor that my friend gave me to use. I never had one with Evelyn and I had only used it a few times to hear his little heartbeat for a few seconds at a time. But this time I couldn’t find his heartbeat at all. I tried again a little later and still couldn’t find it. I started to worry, but convinced myself that it was just a fluke and that my anterior placenta was probably blocking me from hearing him. I tried again several times the following day and still couldn’t find anything. I was really starting to worry now and Michael suggested that I try to move my next doctor appointment up a little bit, so that I could have some reassurance. So I was able to schedule my appointment for Tuesday instead of Wednesday and I just did my best to convince myself that everything was fine while I waited to see the doctor. First thing on Tuesday morning, I went in to see the midwife. I told her about my worries and she tried herself to find the heartbeat, but couldn’t find it either. At this point, I kept telling myself that everything would turn out ok on the ultrasound. She walked us to the ultrasound room and the technician put the wand on my belly. Michael was trying to wrangle Evelyn, so he didn’t see most of what transpired. But I knew right away that something wasn’t right. When we had gone for our ultrasound at 8 weeks, the technician assured us instantly that the baby was there with a nice heartbeat. This time, he didn’t say anything. I knew. I couldn’t see the baby moving on the screen and after a few seconds, I saw him look at the midwife and shake his head. She frowned and looked at me whispering, “I’m so sorry.” I couldn’t believe this was happening. Part of me already knew that he was gone, but the rest of me didn’t want to believe it. I got Michael’s attention and gave him the same head shake that told him the bad news. I think we both wanted to just break down, but we had to keep it together for Evelyn. Next, I met with the OB and he explained the next steps. I could either have a D&E, which he said was not advised at this stage in the pregnancy, or I would have to be induced to deliver the baby. There really didn’t seem like another choice. The idea of waiting for a miscarriage to happen on it’s own seemed unthinkable and dangerous. He told us to think about it, not to wait too long, and to call to schedule the induction when we were ready. We actually tried to entertain ourselves for the rest of the day by taking Evelyn to visit her aunt, going out to lunch, and riding the carousel at the mall. We didn’t have it in us to be cheerful around our daughter and the thought of going home just meant that we would probably break down. I was scared. I didn’t want to schedule this induction…ever. But Michael had to go back to work in two days and suggested we schedule it for the next day so that he could be there with me. I called later that day and we set it up for the following morning. I tried to do some internet research to find out what this process would be like, but it was difficult to find any two stories that were similar. I had no idea what to expect and lots of scary possibilities floating around in my head. But the one thing that echoed through every account that I read was the importance of seeing and holding the baby and taking pictures, for closure and to aid the healing process. Needless to say, I didn’t sleep very well that night. At 7:30 the next morning we arrived at the hospital to start the process of delivering our baby. My plan is to write a separate post about the medical aspects of this whole process, for those who are interested. But I think for now it’s sufficient to say that the induction didn’t go as planned. A process that was supposed to take 12-24 hours ended up taking 48 hours because the medication that they used for induction didn’t work on me. During my stay in the hospital, I joked with the nurses, visited with family, and tried to be strong. But in the moments that I was all alone, I cried for what I was about to lose…what I had already lost…the baby boy I would never rock, sing to, or nurse to sleep…the little brother that Evelyn would never see, never tattle on, and never teach to dance, as she once asked to do. The waiting seemed endless. My body just would not cooperate. Michael and I spent time crying and laughing as we talked about all the people who were already holding Robbie in heaven and what each of them would teach him. As I waited to deliver my baby, my fears vacillated between being scared to endure any pain and being afraid to actually see the baby when he came out. I wanted to get it over with, but I was afraid of what I would endure and see. I felt stuck, trapped. At the end of the second day, I still had not made any progress with the medication. The doctor started offering other options that were scary to me, but I started to feel like I didn’t have a choice. If nothing else worked, I would have to have a D&E, and that meant I would never get to see and hold my baby. I cried, prayed, and gave myself permission to let go. I begged my body to let go of my son, so that I could say my goodbyes. I agreed to try a different method to induce labor. The doctor inserted a balloon device around my cervix and and I settled in for my second night. For the first time since I entered the hospital, I was relieved to finally feel pain. I slept through the cramping and woke every three hours when the nurses came to deliver my medication. Finally, around 4:30 am, I woke up to a severe cramp and then felt a “pop.” Finally, some movement, but no baby yet. I started to feel a lot more pain and requested some pain relief around 5am. I think that the pain meds allowed my muscles to relax enough to just let everything go. Finally, at 8:20am, I sat up in bed and felt my baby enter the world. I was afraid to look, but had to confirm that the baby had arrived before I called the nurse. I peeked under the blankets that covered my legs and saw his little body lying there. I called the nurse and she and the OB came into the room. As he examined our baby, the OB showed us how the umbilical cord was wrapped tightly around his neck and there was also a knot in the cord. It was a relief to know that there was nobody to blame for his death. While I was waiting to deliver, I wrestled with the idea that I might have done something to harm my baby. Maybe it was something I ate, maybe it was the medication I took when I had the flu, maybe it was that one time I scooped the cat litter or drank those few sips of wine. It is comforting to know that I had done nothing to cause this. At the same time, it seems so unfair that there was nothing wrong with our little boy. He was perfect. He died from a freak accident, in the place where he should have been safer than he would ever be on this earth. The nurse wrapped him in a blanket and put a tiny hat on his head. Then they left us so that we could have some time alone with our son. We looked at him for a long time and cried. We didn’t really exchange any words. There was nothing to say. Our beautiful, perfectly formed little boy was dead. It felt strange to do it, but I took a few pictures. I’m glad that I did, even if it’s hard to look at them now. 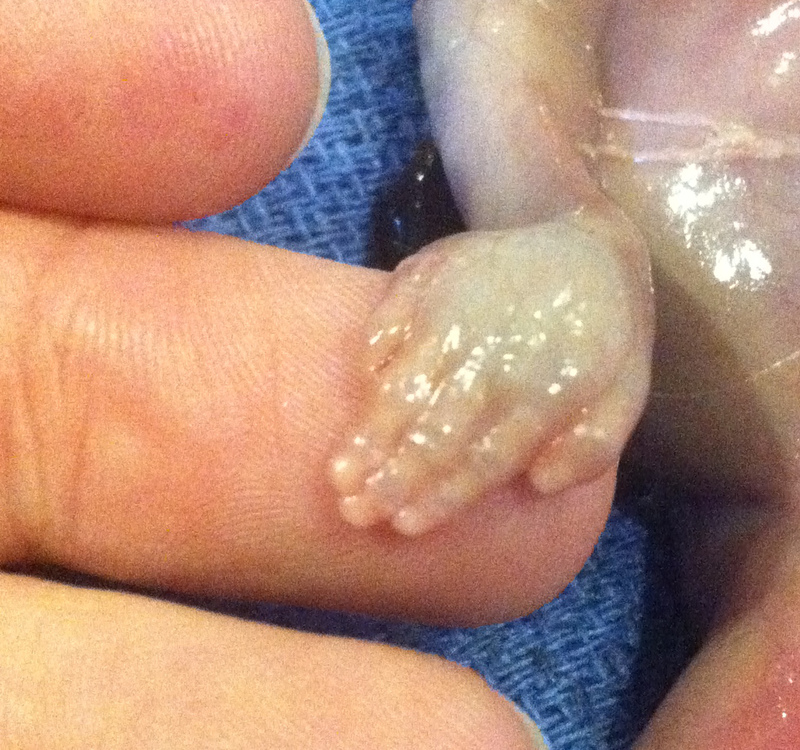 This was my one chance to hold my little boy’s hand…and his tiny hand looks just like Evelyn’s. Because I had reached 16 weeks, we were told that we would have to take care of making arrangements for the baby’s body. I was glad for this because I knew that it would be hard to just let him go and leave him at the hospital. We live about a block away from a funeral home and when I called them to ask about our options, I was told that they would provide cremation free of charge. It was such a blessing to discover that there would be no financial burden attached to the loss of our son. Today we chose a heart shaped locket to contain his ashes and I feel so at peace about the fact that he will be at home with us. I can’t even express how grateful I am that this part of the ordeal was so simple and handled with such compassion. I have no idea where we go from here. It’s been one week since we learned that our baby no longer had a heartbeat, but the wound is still so fresh and I don’t think that I will be ok for very long time. I know that I have to be strong and keep going for Evelyn and for my marriage. I know that Michael is grieving too and we have just been very gentle with one another over the past week. As much as I would never wish this on anyone, it’s a comfort that I don’t have to go through it alone and I know that he understands my hurt because he is feeling it too. I know that God has a plan in all of this. I know that my son is in a better place, but it’s going to be a long time before I can even begin to understand why this happened…and maybe I will never understand it at all. But just like any child would, my son has profoundly changed me already. I will be praying for you and your family. I have no words but I am lifting you up in prayer and will continue to do so. Carrie. I have no words. Just tears. I wish I could hug you and your family. I just read this post today from a sweet friend of mine, and can’t help but think it may be for you. https://rhaggerty1207.wordpress.com/2015/03/13/mothering-from-this-side-of-heaven/ Praying for you. i am so sorry for your loss of robbie. you have written about it in such a beautiful way. i pray for healing of your hearts and peace for your souls. loss is never easy, no matter when it occurs. thanks for sharing about your beautiful boy. ps: i am mil2lissy8 on JM. Carrie, I’m incredibly sorry for the loss of your sweet son. You, Michael and Evelyn will be in my prayers for peace that passes all understanding. Thank you for sharing your story. I lost my daughter on 3/10. I delivered her at 15 weeks. We were also due in August. I know the pain you are going through and will keep you in my prayers. I lost my middle boy at 16 weeks as well. I was completely blindsided at a routine check-up when we couldn’t find his heartbeat. He also died from his cord around his neck. You echoed so many of the things that I remember thinking and feeling at that time. I initially resisted seeing him or having photos taken, but the ob nurse gently encouraged me to do just things and I am so very, very grateful. I’m so sorry for your loss, Lesa. Nothing can prepare us for something like this, right? I wish I would have found this blog a week ago when this happened to me at 16w4d. I don’t have any pictures nor did I hold my tiny baby. These are the things I will always regret. Thanks for sharing your story, comforting to know I am not alone in this journey, even though I feel that way. This could also echo my story. We lost our son at 16 weeks in April of 2014….just like you, I knew the moment he was gone which was several days before it was confirmed by the dr. Since then we have been blessed with a healthy baby boy born at 36 weeks in Nov 2015…I was a nervous wreck the entire pregnancy and couldn’t believe I’d have a healthy baby boy at the end of it until I held him in my arms. However, as I sit here with my 3 month old baby boy sleeping in my lap, I still grieve the loss of our other son who died without explanation! I’m so sorry for your loss. I had a close friend tell me that when she was pregnant with her rainbow baby, there was a period of time when she just wished that she was carrying the baby she’d lost. I had never thought of that before, but I am sure now that if I were to have another baby, I would feel something similar. I know I will always miss him and that he couldn’t be replaced by another baby. Each one holds a special place in our hearts. Congrats on your rainbow…what a blessing! Yes, our 3 month old definitely does not replace the son we lost. If anything, I look at Samuel now and think about missing out on these times with the one we lost. I still wonder what his personality would’ve been like and things like that. The doctors have no clue why he passed….he was normal genetically and there were no cord issues. However the day I believe he passed I had the fright of my life while we were visiting my husbands parents. My 5 year old daughter was playing outside and after a short time I went looking for her and became really frantic when no one could find her. Their house backs down onto a river and images of her having drowned in it came into my head. I literally had to sit down because I almost passed out with fear and my heart was beating so fast. We found out about 20 minutes later that her grandpa had left for the store and she’d jumped into the truck with him at the last minute and he didn’t think to tell anyone. I asked my doctor if a real fright like that could cause a miscarriage and he said probably not, but like you, I didn’t feel pregnant after that and I’m sure that’s when he passed. Having to deliver him alone in the hospital was awful (my husband was home with our other children). It was also really difficult the next morning when I could hear that in the room next to mine a family was introducing a sibling to their new baby brother. All I could think was that we should have been doing that. I know they want you to deliver in the maternity section of the hospital but they really should have a separate room away from others for people who are dealing with a loss…..listening and watching others joy over the arrival of their bundle of joy is very difficult to witness when you’re dealing with a loss. With the passing of time, the grief has lessened somewhat but I’ll always miss him and wonder what he would’ve been like and how he would’ve fit in our family. And our new baby boy doesn’t really change that! I also vividly remember that the maternity ward was very busy while I was there delivering my son. Fortunately, they put me at the end of the hall, kind of away from everyone else, but I could still hear babies crying in the night and I thought about how all the moms were probably so happy to meet their babies, while I was waiting for my dead son to leave my body. The doctors and nurses were so busy delivering babies that hours would pass and nobody would come to check on me. I couldn’t help but think that I wasn’t a priority. My baby, after all, was already gone.